Gerald O'Malley in front of the emergency section of the Lower Bucks Hospital in Bristol last December. O'Malley and 14 of his colleagues at three Philly-area hospitals owned by Prime Healthcare successfully fought to receive the six weeks of wages owed to them. This wasn’t a fight that Gerald O’Malley was going to back away from. 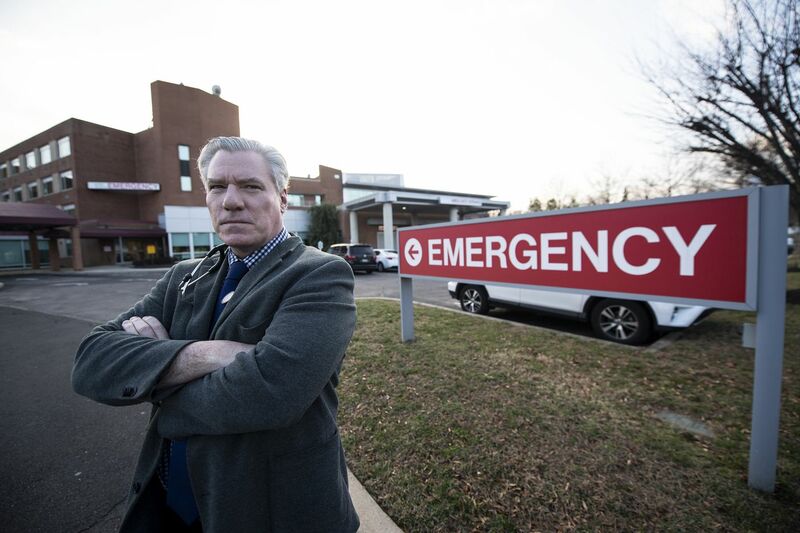 Late last year, O’Malley and 14 of his colleagues at three emergency rooms in the region pushed back against Prime Healthcare, the hospitals’ owner, after losing weeks of back pay during a switch in staffing contractors. The group rejected a proposal by the new company, Progressive Emergency Physicians, to sign a contract and receive the money owed to them as a “retention bonus” if they agreed to a 20 percent pay cut. In early February, the group reached an agreement with Prime, netting the salaries they were owed — collectively more than $200,000 — as well as malpractice insurance and legal fees, according to O’Malley and two others privy to the settlement’s details who discussed the outcome for the first time publicly this week. One doctor, who had been fired by Prime, was excluded from the settlement and is mulling legal action. A spokeswoman for Prime, which operates Lower Bucks, Roxborough Memorial, and Suburban Community Hospitals, did not return a request for comment. Progressive’s chief operating officer, David Calabrese, declined to comment on the settlement Tuesday, saying only that the company is “very proud to be giving exceptional care at all three hospitals” and stressing that each facility is fully staffed. In the fall, Prime unexpectedly terminated its contract with Legacy Physician Partners, a third-party staffing company it had hired to fill the ERs at the three small community hospitals. Legacy, headquartered in Tennessee, had become insolvent, leaving a six-week gap in the salaries of the ER doctors at the local hospitals. In the interim, O’Malley and his colleagues were encouraged, they said, to continue working with the promise of being made whole. Progressive, as Legacy’s replacement, offered to give the doctors the money Legacy owed to them incrementally as a term in a new contract. Some signed, but others, including O’Malley, felt the practice was predatory — Progressive’s contract came with a 20 percent cut in salary. The 15 doctors who left began a public-information campaign, speaking out against the practice they deemed unfair. They hired a lawyer, sought guidance from industry groups, and staged one, effective demonstration. During a January corporate event held by Prime at the Manayunk Brewing Company, O’Malley and his colleagues showed up wearing custom T-shirts printed with the words “Hey, Progressive! Where’s my money?” Two days later, their lawyer received a phone call from Prime’s legal team. The group plans to present a sample paragraph with that language at the American College of Emergency Physicians convention this fall.